Disney's new animated film, Wreck-It Ralph, is about a video game villain who unleashes a powerful enemy from a first-person shooter. According to these scans from D23 magazine, the movie might have an all-star cast of nemeses, too. 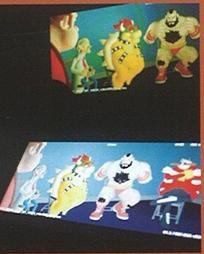 This picture — reportedly of the movie, though admittedly not the finest quality — shows Bowser, Dr. Eggman and Street Fighter's Zangief getting together for a sit down with Ralph in what looks like a talk show setting. Perhaps they're discussing how they stay in shape; we really don't know. At the moment the details are pretty hazy, but if Disney's making a movie about video games it makes sense to feature some of the gaming world's biggest and brightest stars, even if just in cameo appearances. We'll keep you updated.